Over the Christmas period, I went in search of distractions. Specifically, of new apps that would entertain me while wasting my time. (I’m trying to give up on apps that promise entertainment but actually just waste time in various elaborate ways.) The result of this search was two promising free apps, Clumsy Ninja and QuizUp. As usual, I’m a little late to the party in both cases, but they’re an interesting study in contrasts anyway. Clumsy Ninja (Natural Motion, iOS, Free) is the latest in a long line of virtual pets, stretching all the way back to Tamagotchis. In this case, your task is to take a clumsy ninja (hence the title) and train him up until he’s capable of rescuing his friend from a mysterious villain. The story is a thin veneer at best, but really it’s all about playing with your ninja using various toys. He has plenty of character, and though he’s not as reactive as some virtual pets, the sense of progression will keep you coming back to play with new toys as your ninja visibly improves. QuizUp (Plain Vanilla, iOS, Free) is a very different beast. Rather than you and a virtual pet, it’s you versus the rest of the world. Melding Wikipedia, table quizzes, TV quiz shows and social networks, it challenges you to compete against anyone, anywhere on the topics of your choice. It’s a genius move—most people have at least one topic that they’d consider themselves to be an expert on, and QuizUp offers rewards for that expertise: rising through global and national leaderboards, crushing your friends and showing off. And if that’s appealing to the general public, it’s going to be even more appealing to true quiz freaks (like yours truly). As free apps, both Clumsy Ninja and QuizUp rely on in-app purchases for funding. More specifically, both of them thrive on human impatience. Ninja allows you to buy crystals (part of its by-now standard two-tier currency system) that allow the purchase of in-app goods, such as costumes, or quicker repairs to training equipment. However, you can earn a small amount of crystals through the game itself, and the sense of progression is balanced so that you never feel things are going punishingly slow. QuizUp’s in-app purchases are a little trickier: you buy experience boosts to double, triple or quadruple your experience gains from every quiz you take part in for an hour. It’s therefore possible to shoot up the ranks a lot quicker than non-paying competitors, but it won’t be cheap. Plus, it doesn’t matter how much you pay: head-to-head, it’s all about knowing the answers to the questions. In fact, those who don’t pay might have an advantage there: there are a finite, albeit plentiful, number of questions on each topic, and by the time you’ve reached the upper ranks in any topic you’ll likely have memorised many of them. Both games obey the important rule for phone apps of keeping play times short and sweet. Each individual QuizUp bout lasts a maximum of just over a minute, so you can fit plenty into a bus trip, and even one or two into waiting for the kettle to boil. Similarly, with Clumsy Ninja, you may have a few tasks to complete and 4-5 training items to use, but a few minutes will see you through all of them, and built-in “repair times” mean there’s no need to play more than once every couple of hours. It’s not hard to see why both of these apps are as successful as they are. Clumsy Ninja is polished, sweet-natured and rewarding, and it’s gentle with its in-app purchase prompts. It’s the first time I’ve played around with a Virtual Pet app, and while I’m not in love with the concept, I’m enjoying it enough to stick around for now. That said, QuizUp is by far my favourite of the two apps, and that’s not just because I love quizzes. Its use of social networks to provide a competitive environment and supply it with a bank of questions is inspired, and there are a multitude of clever touches. Games against random strangers are played in real-time, but you can challenge your Facebook or Twitter friends to asynchronous duels, with the app reporting the results once you’re both finished. It’s not quite perfect, but the few problems it has will likely be resolved with time. As mentioned, expert players have probably memorised most of the questions in their favoured topics, making duels with them more a matter of memory and speed of reaction (you get bonus points based on how quick you answer a question) than knowledge. However, the app’s web site permits users to submit questions (which can be queried in-game, adding a Wikipedia-like quality control element to proceedings), potentially solving that issue over the long term. The other issue is probably just a niggle for me: the app’s presentation of its gathered data. There’s no clear way to see your head-to-head record against a friend, and the app itself conflates categories (science, history, etc.) with their constituent topics (Chemistry, Ancient Rome, etc.) in presenting user statistics. A little more thought applied to this area could really sharpen QuizUp up. Ultimately, though, it’s the application of the social that sets QuizUp apart. In Clumsy Ninja, training your ninja up only matters to you and your pet. In QuizUp, you can become the best in your country or even the world at a given topic, if you’re willing to put the time in. * And that’s just far more of a draw. 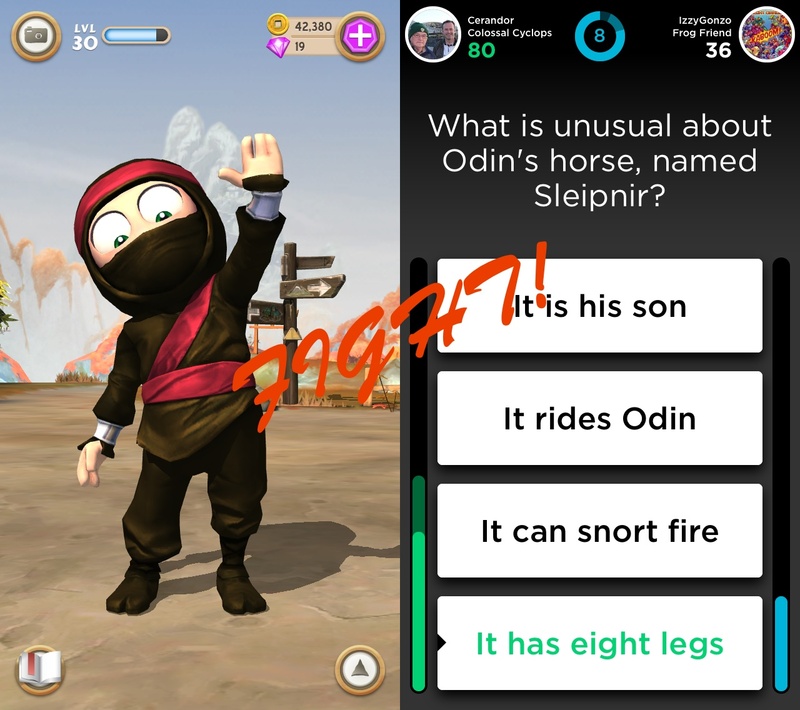 Maybe a future version of Clumsy Ninja will offer duels or obstacle course races between users’ ninjas, but for now, it’s QuizUp by a length. Previous PostDoctor WhyNext PostDon’t Be Evil?